Trying to capture the energy workers of the garden is challenging. The bees move so quickly it is hard to find the perfect shot. The Astilbe is growing rapidly now it is in full sun. It loves this location. 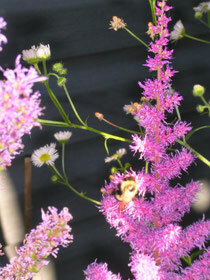 The butterfly bush and the accompanying lavender also attract bees to the garden. To enhance my Reiki practice I have been meditating on a regular basis. My meditations have been creating a sense of relaxation in the evening. I also am treating Bella to regular reiki sessions in the evening which she enjoys. Meditation and reiki are complimentary and both reduce stress.